Not everyone loves Valentine's Day. Some don't have a significant other, some don't like the crass commercialization, and some just aren't the type to make a big deal out of things. 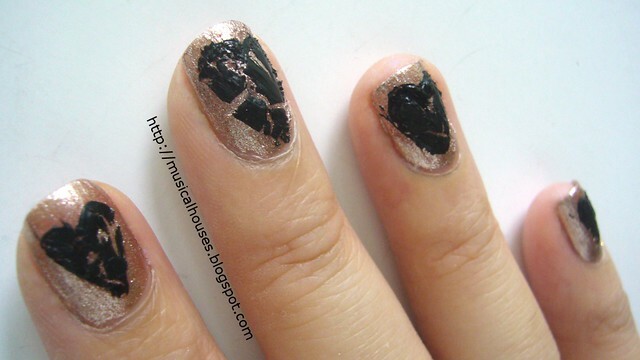 So, here's my Anti-Valentine's Day nails - shattered hearts! I figured, since I already paid my dues by having Valentine's Day nails (not once but twice! C.f. my Valentine's Day nails with a touch of spring and my Neon pink and black Valentine's Day nails), why not do an Anti-Valentine's Day mani? I decided to work with the theme of being heartbroken, and decided to have a girly pink base with broken hearts. The pink base was Orly Rage (I've previously compared Orly Rage and GOSH Frou Frou), a gorgeous opaque, non-streaky and non-brush-strokey pink foil. (Is non-brush-strokey even a word?) 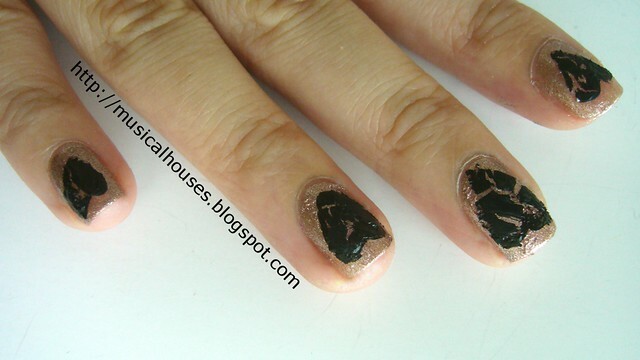 The black hearts were made with OPI's Black Shatter, although any black crackle polish would have done too. In my head, this seemed like a good mani, since shatter polishes naturally crackle, so they lend themselves well to the "shattered hearts" look I was trying to achieve. The hard part was getting them to take the shape of a heart! I tried everything - freehand, tape, self-made stencils using paper and scissors - and nothing worked really well. They just looked like random shapes, not hearts. In the end, I just filled out the heart shapes more fully using my Wet n' Wild Black nail polish. I don't know if these look anything like hearts to you, but that was probably the best I could do. I liked the concept and the "shattered hearts" idea, but I'm feeling a bit meh about my execution. But still, here's my Anti-Valentine's mani! What do you guys think? Shattered hearts, or just mere blobs? I think this would look good with a Lisbeth Salander outfit! Brilliant idea! I never would have thought to do this! Very very creative! Definitely a bit sad but perfect for those days when you don't give a care and want to strut around happily alone! Really good look expecially for if you do not want to be different on valentines day. Really like the cracked look in the hearts. I love it. I will have a shattered heart this year. I love it. Esp since I will have a shattered heart this valentine's day. This is cool! I love your shattered heart mani. Very cool idea. The only thing I can think of to make the hearts look more heart-like, is to have your nails painted one color, paint heart on top in another color, and then paint the crackle polish just inside the edge of each heart. I'd have to try it to see if it really worked though. @auroragyps: Sounds awesome! I can't wait to see your green broken hearts mani! Great minds think alike! We posted different takes on the same idea on the same day! I like your hearts better than mine, though.